AUE Absolute FINAL Photo Contest!!!! 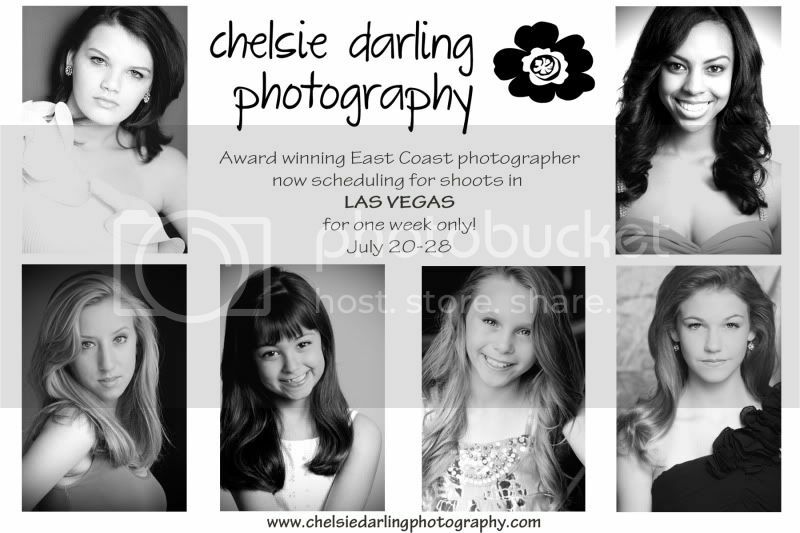 Only $45 for UNLIMITED Natural, Glitz & Comp Cards! Samara Has Exciting AUE News!!!! AUE has added a stage shot event!!! Submit your favorite stage shot at nationals. Only $25 to enter!!! If you enter this event, you can enter the snap shot catagory for FREE !!!! AUE Discounts Are Still Available!!! Email: MadonnaHM@aol.com To Get Yours!!!! IT'S NOT TOO LATE TO JOIN US!!!! Do you have the CASH?!?!?! Annabelle won the Jackpot with her Toni O!!!! Get Your Winning Looks Today! click the banner to visit Toni Overby online!!! Don�t Miss Our BIG Summer Discount!!! Enter The Works For $299! YOU CAN DO THE WORKS FOR 1/2 OF THE ORIGINAL $598.00 WORKS PRICE IF YOU SEND IN A $200 DEPOSIT AND BOOK IN OUR HOTEL BLOCK (must be booked under Southern Beauties and Beaus) by JULY 31ST!!! WOW! THIS LETS YOU ENTER THE WORKS FOR JUST $299.00!!!!. THIS IS A FANTASTIC PRICE TO ENTER THE WORKS SO PLEASE DON'T MISS OUT. 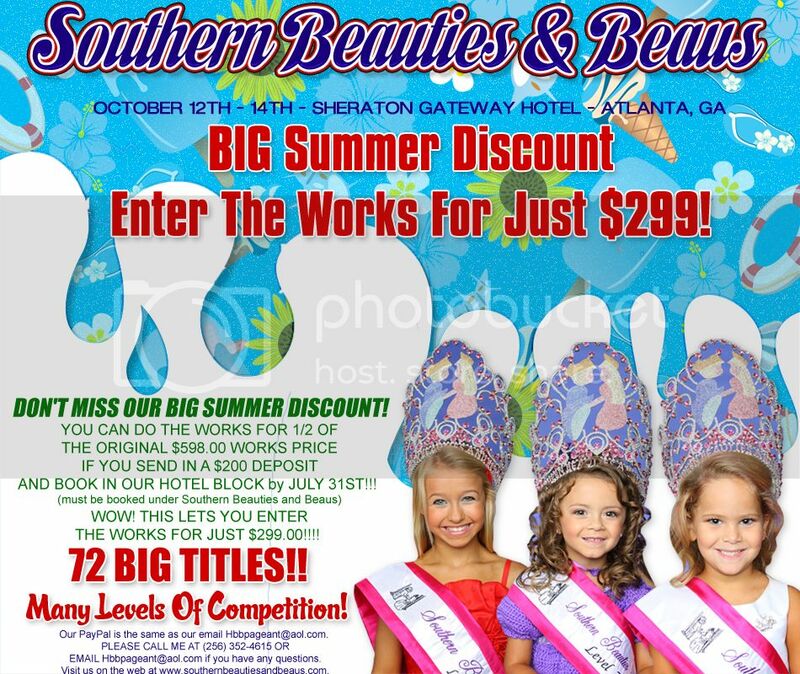 FIRST - CALL THE SHERATON GATEWAY AT 1-800-784-9400 BY OR BEFORE JULY 31ST AND TELL THEM YOU WANT TO BOOK A RESERVATION UNDER SOUTHERN BEAUTIES & BEAUS. THEY WILL GIVE YOU AN EVEN BETTER RATE IF YOU BOOK EARLY. YOU CAN GET A ROOM FOR $82.00 PLUS TAX INSTEAD OF $94.00 PLUS TAX. SECOND - FILL OUT AN APPLICATION AND MAIL OR PAYPAL A $200 DEPOSIT BY OR BEFORE JULY 31ST TO HOLD YOUR PLACE AND GET YOUR $299.00 WORKS PRICE. PLEASE INCLUDE YOUR RESERVATION CONFIRMATION SO THAT WE CAN MAKE SURE THE HOTEL PUT YOU IN OUR BLOCK. THIRD - IF YOU HAVE A SIBLING, YOU CAN BRING THEM AND THEY CAN ENTER THE WORKS FOR 1/2 PRICE OF THE SPECIAL. YES, YOU READ THAT RIGHT, YOU CAN BRING A BROTHER OR SISTER AND IF YOU DO THE WORKS FOR $299.00, THEY CAN ENTER THE WORKS FOR JUST $149.50!!! FOURTH - GET READY TO ENJOY A FUN-FILLED NATIONAL PAGEANT THAT NEVER PRORATES AND GIVES ALL AWARDS, GREAT PRICES, AND GORGEOUS CROWNS. WE ARE ALSO AWARDING NEW GORGEOUS CUSTOM CROWNS FEATURING OUR SOUTHERN GIRL AND BOY. AND MANY LEVELS OF COMPETITION!!!!! THIS IS THE YEAR TO ENTER!!! Our PayPal is the same as our email Hbbpageant@aol.com. 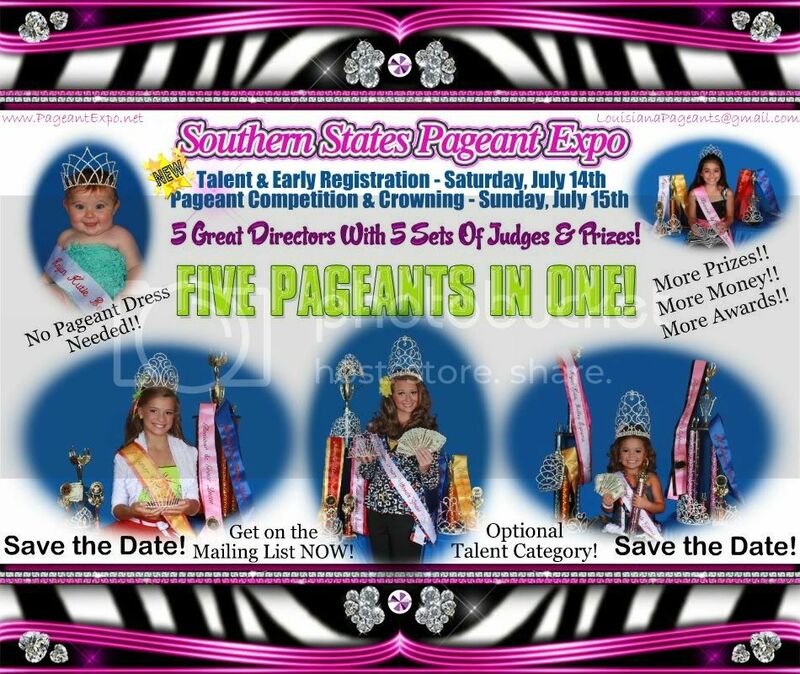 PLEASE CALL ME AT (256) 352-4615 OR EMAIL Hbbpageant@aol.com if you have any questions. 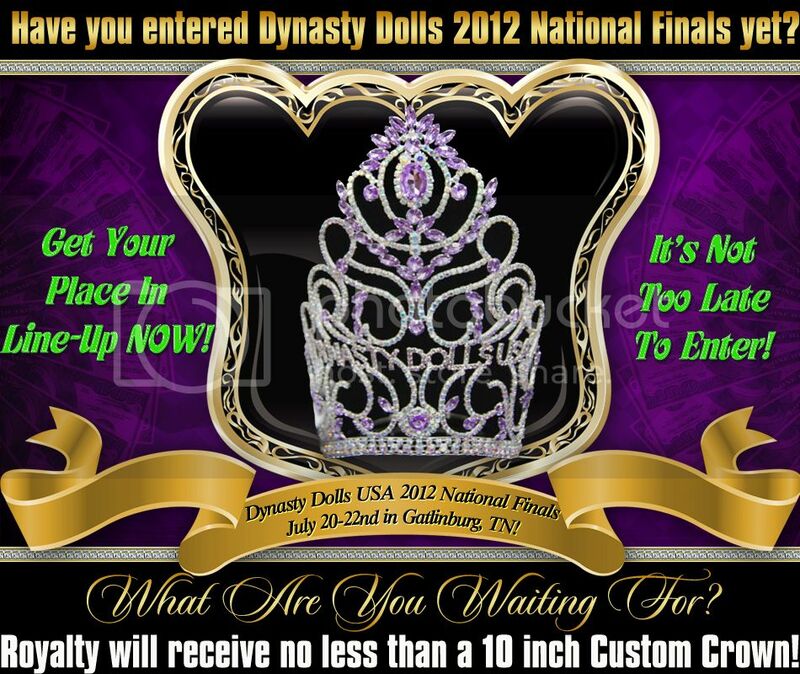 Have you entered Dynasty Dolls 2012 National Finals yet? 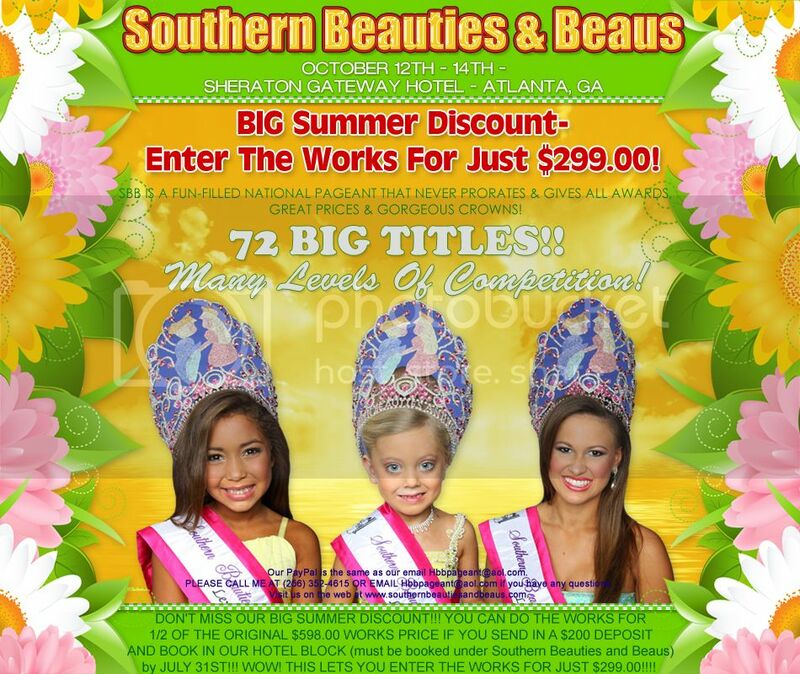 Compete in Natural or Glitz Beauty, we have titles for both! 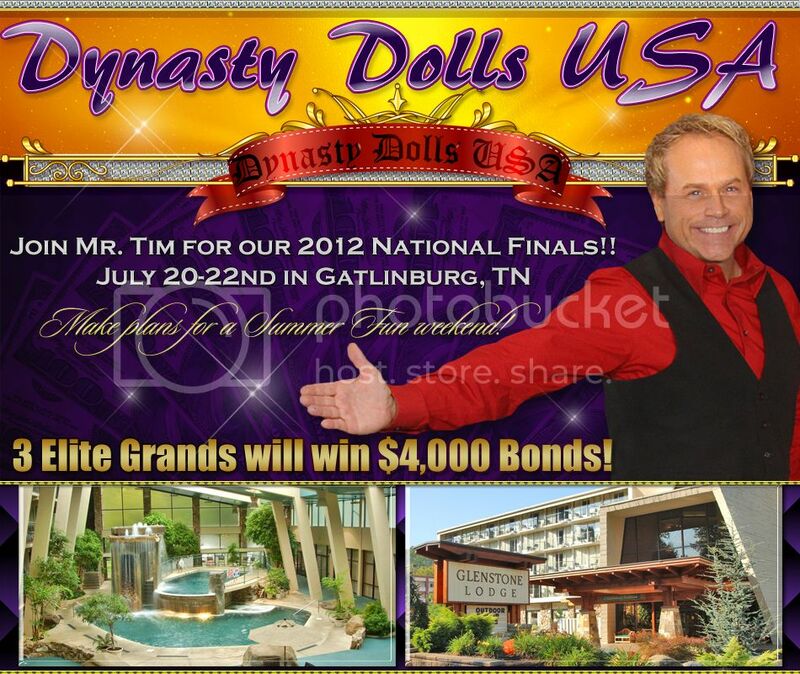 Plan a weekend getaway in Gatlinburg, Tennessee and join us at Dynasty Dolls USA! New Christmas Theme this year! for the "Best Christmas National EVER"! Our National Paperwork coming soon! Visit our website for more info. and your entry form. DIXIELAND IS ONLY 2 DAYS THIS YEAR! FOR $895 OR THE SUPREME PACKAGE FOR $195!! 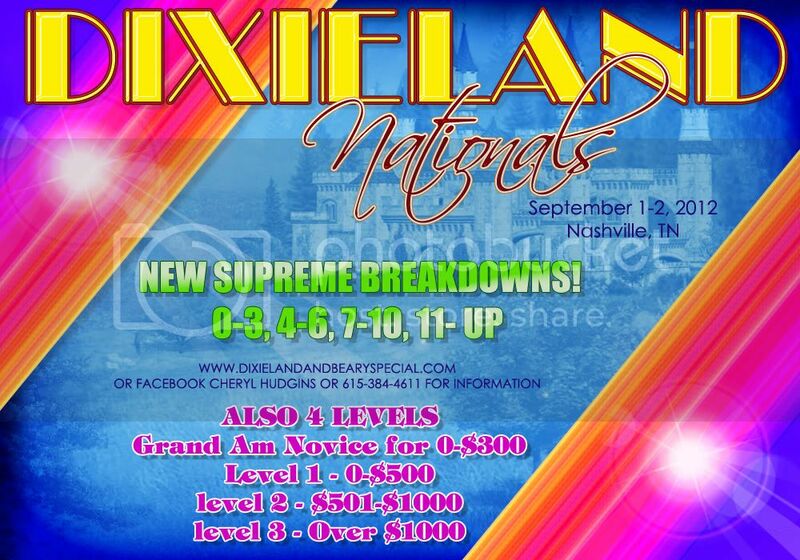 Dixieland Dolls & Darlings Nationals September 1-2, 2011! More Money For More People...Over 80 Titles!! Only 2 Days This Year September 1-2nd! 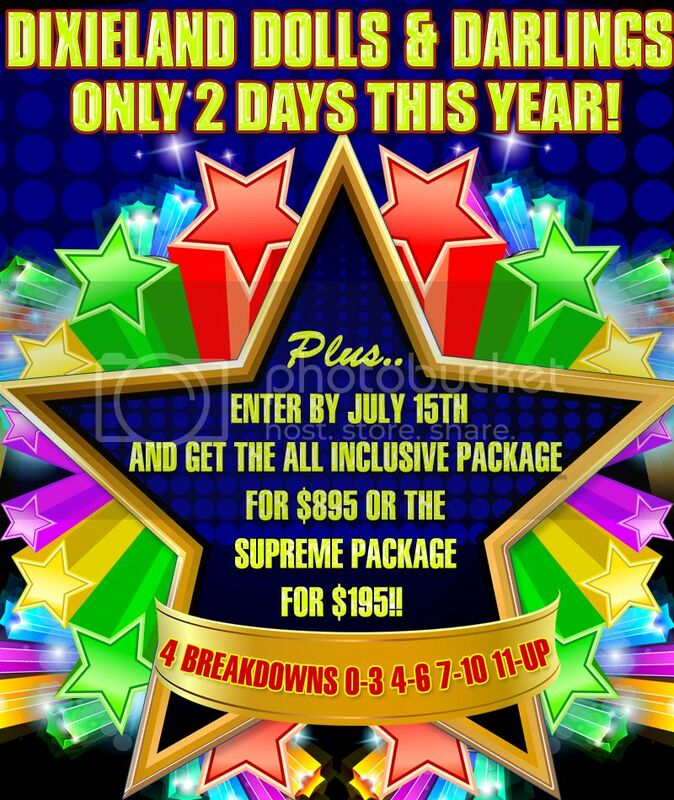 (must be booked under Southern Beauties and Beaus) by JULY 31ST!!! Enter Today So You Don't Forget! Win your $695 Saver Package PAID to TDS!! BEAUTY + ONE Optional Event! Enter as many or as few optionals as you like! NEW PRIZE: Tickets to see Justin Beiber! It's Not Too Late To Join Us!!!!!! SO MANY CASH PAYING TITLES OFFERED! You Could Win BIG Beachside! 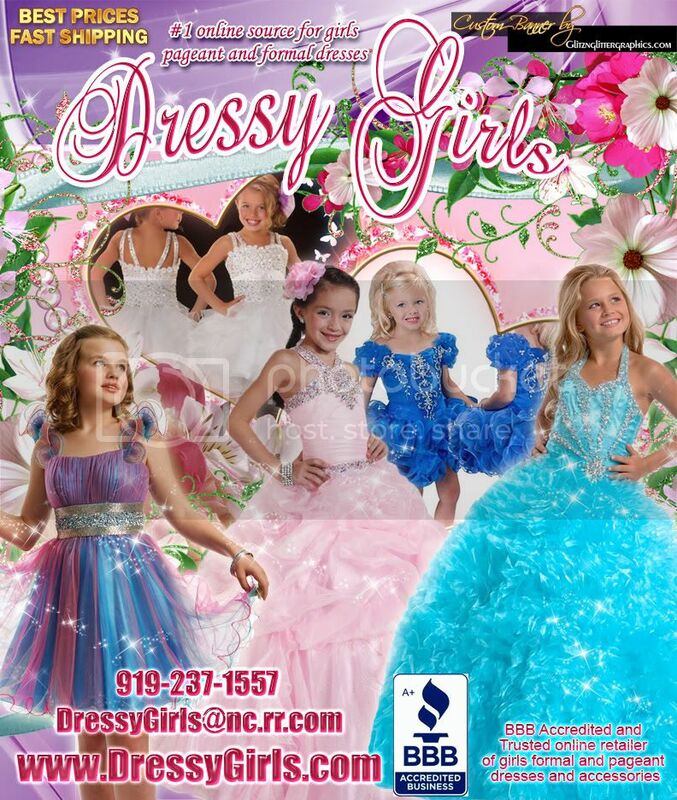 A Pageant For Boys & Girls Of All Ages! Compete in Glitz, Natural, or BOTH! Double your chance to win a Grand Supreme title. 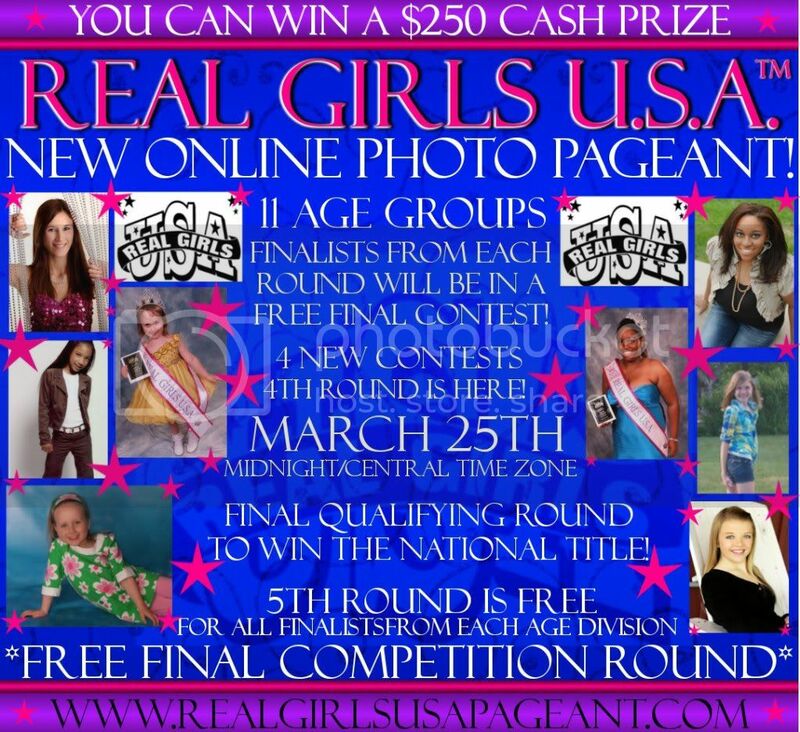 Click on the banner for more information on this exciting pageant! BOOK YOUR ROOM AT TRADE WINDS ISLAND GRAND! WOW! Visit the hotel web site or call direct to book! Mention the America's Fabulous Faces Room Block to get the BEST rate! If You Plan To Join Us, E-mail Us!! Don't miss your chance at some great deals! Preorder Your Photo CD/Competition DVD TODAY! medals, plaques and more... at competitive prices! Visit our website for beautiful crowns with great prices! New inventory added each week. Win your fees paid to our National Finals! Photo Contest - Deadline to enter is June 14th! Don't miss the June 14th deadline to enter! E-mail gorgeousgirls@embarqmail.com for your entry form. You're Invited To A Birthday Party & A Summer National You Don't Want To Miss! Make plans to join us for a fun filled weekend! 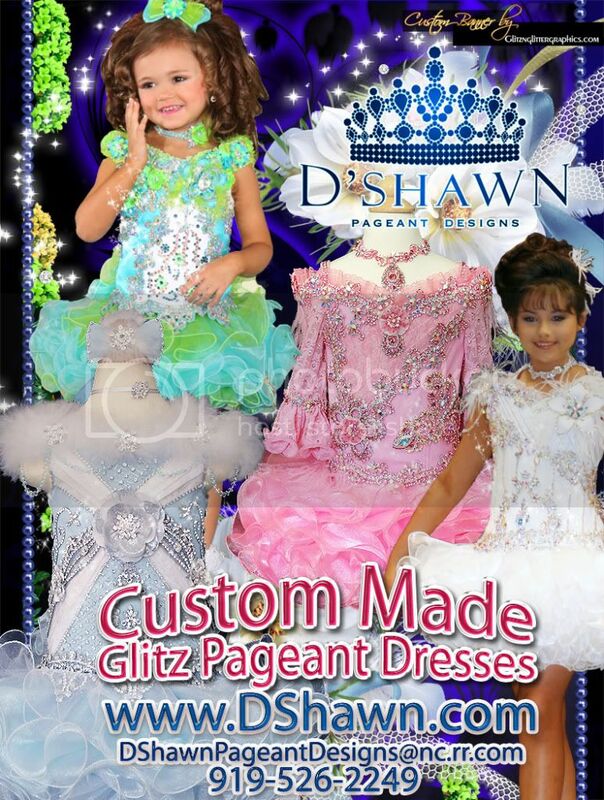 Custom Crowns and so much more! Website coming soon! E-mail gorgeousgirls@embarqmail.com and I will be happy to add you to the list! Our website will be ready soon! for a fun getaway and TWO pageants in ONE weekend! 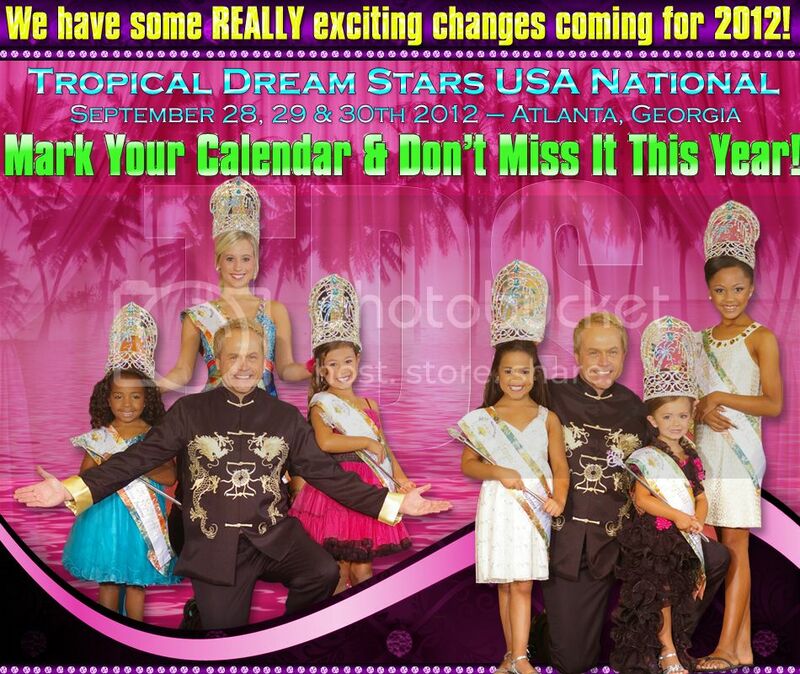 Tropical Dream Stars USA 2012 September 28-30th! *NEW* TDS National is Beauty + ONE Optional This Year! Paperwork is online and printable! This could be YOUR Mommy this year! Don�t forget, TDS is now Beauty + ONE highest optional + Supreme! Super Saver Package is ONLY $595! LOWER Price! Click on banner to enter today! You could be this years cover winner! This is THE place to be this summer! ** International Fresh Faces **Daytona's year-round family fun center! to keep your excitement high all day long! Island Hopper, MEGA Arcade, and Waterpark Cabanas! you can also find online coupons towards the waterpark! *90 day fallback on age divisions! This is a one time deal! Last chance.....don't miss this offer! 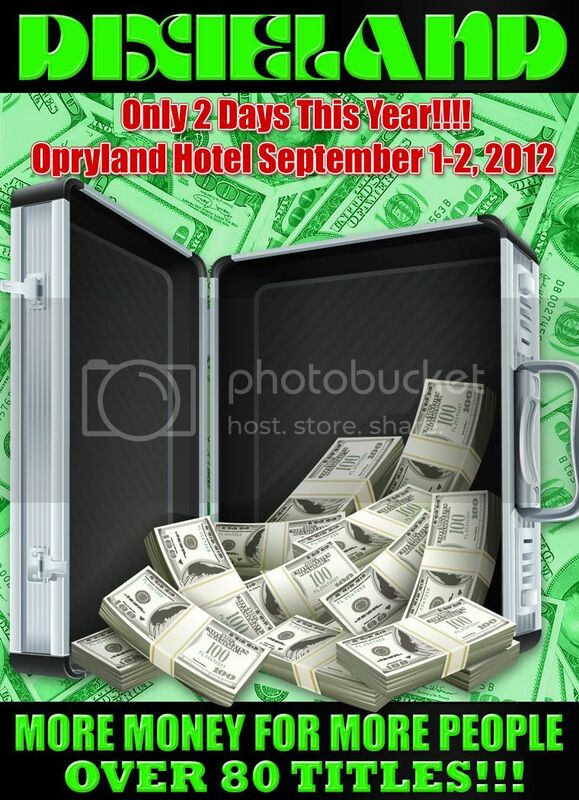 #1-Pay your $50.00 Registration fee by 9/14/12 and get 2nd OOC Free. #2-Pay entry fee in full by 9/30/12 and receive $25 off fees! For application or more information, please email the director at ddawestcoastmininationals@gmail.com. Vendors, please contact me to add your name to the vendor list! . Click on Banner to order your APA GRAPHIC TODAY!! OUR National Paperwork is ready! E-mail: callus@embarqmail.com for your entry form! Don't Miss Your Chance To Win An Adorable Title! Beauty + ONE optional = Supreme! TDS has lots of optional�s for you to choose from but you only need ONE added to your beauty score for Supreme! Super SAVER package ONLY: $595! TDS is putting on a brand new look! NEW LOW, LOW package price! NEW Beauty + ONE highest optional = Supreme! 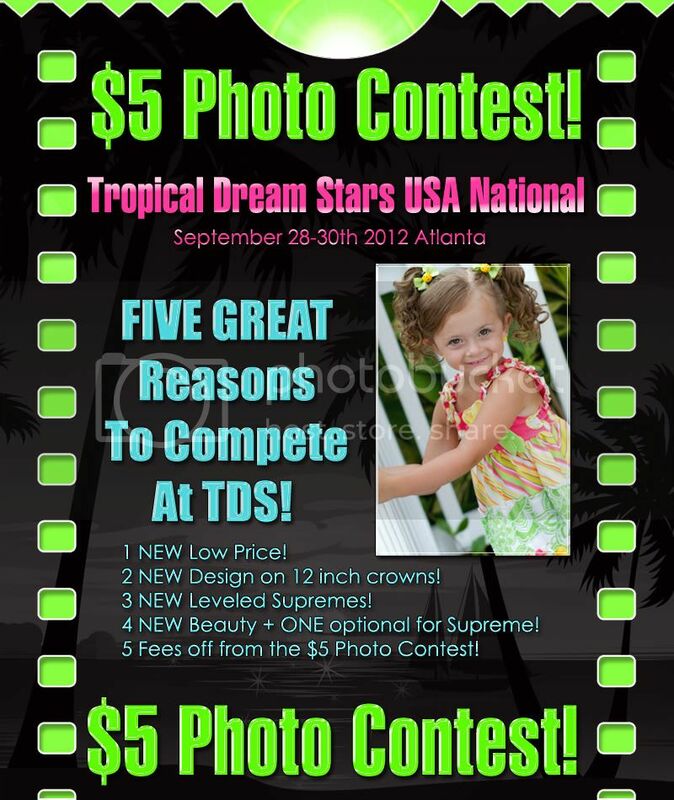 Tropical Dream Stars USA National Photo Contest! Only $5 to enter and you could win your fees PAID! National Paperwork Will Be Ready Soon!!! Winners will be notified via email by May 5th. 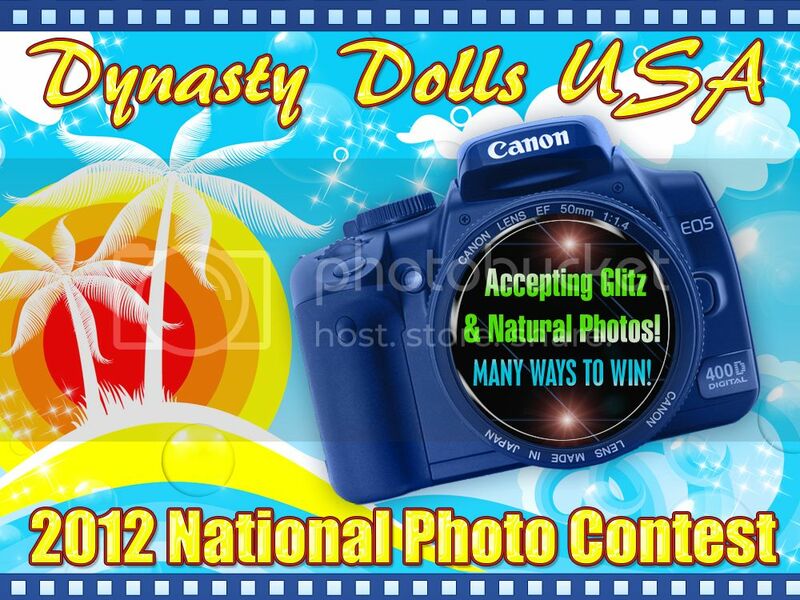 Glitz & Natural Photos Accepted! Receive 3 Nights Hotel Fees Paid! Entry fee is $75.00 you may enter 2 photos for this fee! and one natural this doubling your chances to win grand supreme!! OUR PAPERWORK WILL BE READY SOON!!!! More info. coming, stayed tuned! 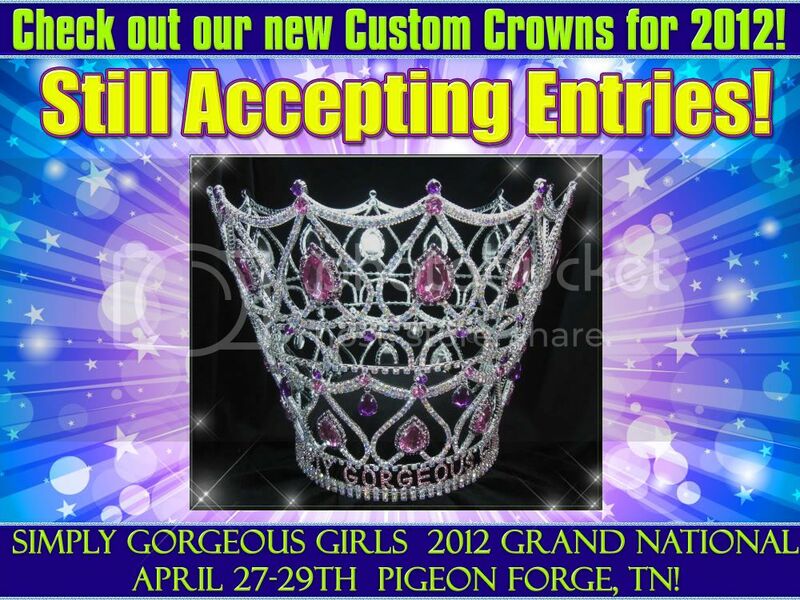 Check out our new Custom Crowns for 2012! You could win one of these GORGEOUS Crowns! early bird, $495 Package or any other discount! Time is running out, make plans now to join us! Our entries are low, never a better time to enter! It's going to be a Simply Exciting Weekend! Compete your age as of January 1, 2012. 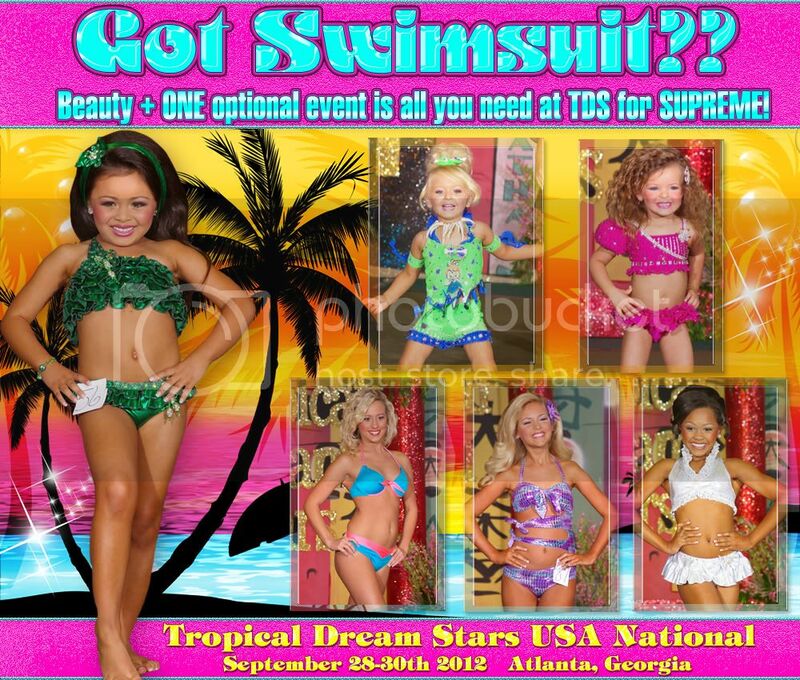 SGG is not glitz, not totally natural, we're back to the basics of Pageantry! If you've not entered, what are you waiting for??? Deadline Friday - Cash Paid Saturday! Click on the Banner or Email premiercrowns@gmail.com Today! Perfect H&M for Natural AND Glitz without paying a fortune! Never pay over $200 ~ Email MadonnaHM@aol.com today to book! SPECIAL PRICING FOR THIS ONE DAY EVENT! Call 502-457-3405 or email MadonnaHM@aol.com for booking! Save The Date September 28-30th! These are our beautiful Grand Supremes! 3 Grand Novice Supreme�s Blake Hart, Kaitlyn Wheat & Lauren Pederson. 3 Grand Supreme�s Bailee Beard, Alona Locklear & Queen Huntley. Tropical Dream Stars has some BIG changes in the works! ALL NEW Crowns! Still fabulous and custom! Prettier than ever! More surprises and details to come! Stay tuned! Save the date! You won�t want to miss it! 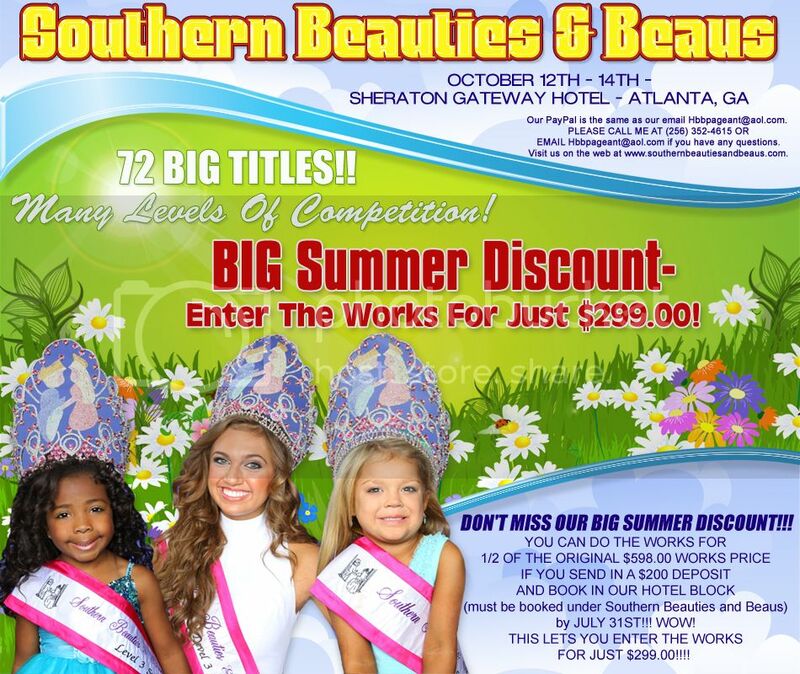 TWO pageants, ONE weekend� ONLY $195 to enter BOTH! WIN ONE OF THESE AMAZING CROWNS! 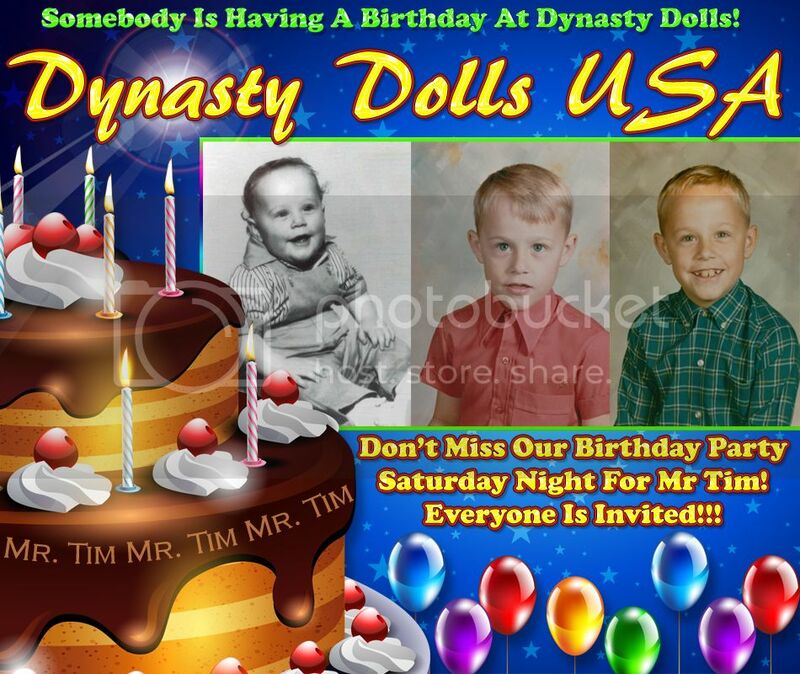 Join us for a super fun DOUBLE pageant! TDS & AGM Summer Spectacular! Save the date and plan to join us in the COOL mountains this summer! TDS is full glitz and AGM is toned down facial. TWO pageants in one weekend. Glamour Girls 2012 National is This Weekend!!!! Perfect H&M That Only Looks Expensive! WOW only $95 for ALL Events!!!!! Award Winning Results that are 2nd to None!!! GG has added a "Stage Shot Photo Catagory"
Bring your favorite stage shots from ANY PAGEANT to enter them in this photo catagory!!! Judged on facial beauty & personality. We Can't Wait To See You This Weekend at GG !!!! Do You Know What Time It Is ???? click the banner to visit Glamour Girls online!!! Glamour Girls is This Weekend !!!!! We Can't Wait To See You All in Louisville!!!! What Does It Take to Hit it BIG at Glamour Girls? A Gorgeous Face & Lots of Personality!!! You Still Have Time to Join Us!!!!! :: H/M with Michael Booth ::Now Booking for Glamour Girls!